Symbiosis Institute of Operations Management, Nashik organized its flagship event, Tattv, on September 8, 2018, at its premises. Tattv, the annual operations converge of SIOM, provides a platform at which eminent personalities industries join forces to address challenges, develop solutions, discussed advancements and trends ubiquitously relevant in operations management across domains. The topics this year revolved around the theme ‘Operations Ontogenesis: Towards Business Excellence’ along with deliberations about groundbreaking technologies and topics elemental to operations and Supply Chain Management. 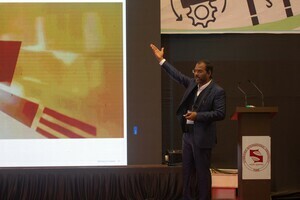 Event witnessed the presence of reputed industry personnel who in their keynote speeches enlighten all with their experiences, research and thoughts. Mr. RV Sridhar, CEO at Essar Steel, Mr. Procyon Mukherjee, Chief Procurement Officer at LafargeHolcim, Mr. Mahendran Subramanian, Senior Vice President at Scope International, Standard Chartered, Mr. Shekhar Tewari, MD, Accenture marked their gracious presence at the event. They expressed their thoughts on how AI is contribution to digital transformation, what role can big data play in Operations, the impact of IoT on the supply chain, Block chain for operational excellence etc. Other prominent speakers Mr. SB Raju from Eaton Corporation, Mr. Hemant Dhingra from Tata teleservices, Mr. Bhaskar Jha from HPCL, Mr. Sujay kumar from Ecolabs, Dr. Satish Raghavendran from Cognizant, Mr. Alok Sharman from York transport equipment, Mr. Amit Ahluwalia from GE Power, Mr. Manish Deoghare from AMD Management Consulting, Mr. PM Balaji from Toshiba and Mr. Amol Lele from Armstrong, Mr. Rakesh Singh from ISCM marked their presence. The event successfully fulfilled its objectives for which it was envisaged. Along with the delegates, the fostering minds of SIOM strode various miles on the path of knowledge.